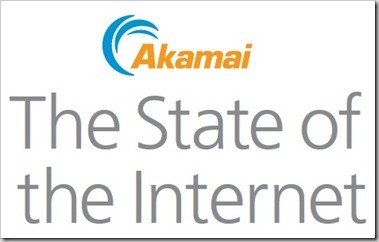 According to the 2011 State of the Internet report (Third Quarter) by Akamai Technologies, India has seen slightly encouraging trends in broadband adoption and increased hyperconnectivity in the third quarter of 2011. This report provides insight into India-centric factors such as internet penetration, observed attack traffic, global and regional connection speeds, mobile traffic, data consumption, mobile connectivity broadband adoption amongst many others. Let’s take a look at the Broadband and Hyperconnectivity trends across India and Asia that this report points out. The report estimates that Indian broadband adoption which is greater than 2 Mbps touched the much anticipated 10 percent threshold. This means that there was a growth of 45 percent quarter over quarter. On the other hand, high broadband adoption which is greater than 5 Mbps, grew at 0.6 percent. This indicated a growth of 46 percent quarter over quarter. The report states that the average connection speed in India was about 0.9 Mbps. This marks a 12 percent sequential quarterly growth. India still significantly lags behind her neighbor China, whose average connection speed was measured at 1.4 Mbps. With the kind of growth in IT services and products that India is experiencing, it is unfortunate that India remains the only measured country in Asia with average connection speeds below 1 Mbps. Comparatively, the global average connection speed by comparison grew by 4.5 percent to 2.7 Mbps. Interestingly, the report goes on to mention that Hyderabad and Chennai have been the only two Indian cities with average connection speeds of 1.5 Mbps and 1.2 Mbps respectively. Surprisingly, Bangalore missed out on being in the top two. Average connection speeds in New Delhi, Mumbai, Bangalore and Kolkata were at 0.8 Mbps, 0.8 Mbps, 1.1 Mbps and 1.1 Mbps respectively. The figures stated in this report reveal the growing complexity and frequency of web-based and port-based attacks. This only goes onto highlight the urgency and need of sophisticated online security systems. During the third quarter of 2011, attack traffic originated from 195 unique countries / regions. The same figure was 192 in the second quarter in 2011. Not very surprisingly, India ranked eighth in terms of global attack traffic origination with 3.7 percent attacks being of Indian origin. As far as the rest of Asia is concerned, its attack traffic origination share grew from 47 percent in the second quarter to 49 percent in the third. Here are the countries that accounted the most for attack traffic in the third quarter of 2011. In comparison to the second quarter, the attack traffic concentration declined from all the top 10 ports with 68 percent being observed attack traffic and the top 10 countries generated 76 percent of observed attacks. The top ports to be targeted by attacks remained the same as they were in the second quarter. Interestingly, Port 445 remained the target of many observed attacks, more than any other ports in the top 10 list. India is awaiting steadier growth in its connection speeds so that new business models and innovations can be achieved by industries in an uninterrupted way. The last decade saw a significant increase in broadband adoption and Internet access in India in a way that dial-up connection has almost completely been wiped out. What remains to be seen is how well broadband penetrates into the rural and sub urban regions in India in the coming years. India’s Biometric Adoption Highest in the World; But Is It Secure Enough?